Fransje van Riel was born in Holland but moved to the East Sussex countryside, where she attended high school in the small village of Forest Row. Upon her return to The Netherlands, she embarked on a career in the airline industry, which saw her flying to all corners of the world, including East Africa and which rekindled a childhood passion for nature and wild animals. Unable to resist Africa's beckoning calls, Fransje eventually resigned as Royal cabin attendant for KLM to settle in South Africa, where she pursued a career in writing. After covering numerous travel and wildlife related stories for a variety of South African magazines and newspapers, Fransje began writing her first book; a moving story about Karin Saks, who had dedicated her entire life to the welfare of primates. Life With Darwin and Other Baboons was subsequently published by Penguin South Africa with translation rights sold to Dutch publishing company The house of Books. Fransje’s second book The Crowing of the Roosters chronicled the true life story of a young Xhosa girl called Nomfusi Yekani, which spanned five decades set against the backdrop of South Africa's apartheid government regime. The book was published by David Philip (Spearhead) and was the recipient of a nomination for The 2006 Sunday Times / Alan Paton Awards, Africa’s premier literary award. After travelling around Southern Africa to write other freelance environmentally-orientated stories that highlighted wildlife projects, Fransje accepted the position as ambassador for SA.MAST (South African Mass Sterilisation Trust); an organisation dedicated to free primary care and consistent spaying of dogs and cats in previously disadvantaged communities. She also works to raise awareness and funds for the Caprivi Carnivore Project, established by Lise Hanssen, who studies the demography and population dynamics of spotted hyaenas and other large carnivores in Namibia’s Caprivi Strip; now part of the largest Peace Park in Africa, the KaZa Transfrontier Conservation Area. 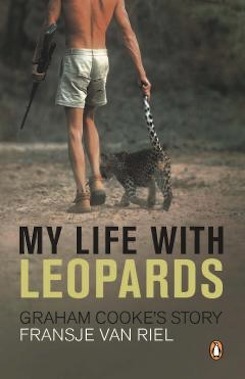 Her latest work of non-fiction, My Life with Leopards, Graham Cooke’s Story is the story of a young man who is given the task of parenting two six-week old leopard cubs to adulthood in the middle of the South African bush until the time comes that the grown leopards are due to be released in the Zambian wilderness of the South Luangwa Valley. The book was published in September by Penguin SA and is currently listed as part of the Penguin US and Penguin UK catalogue. This is the fourth book she has ghost written, following an earlier animal story for a private client from the UK, who consequently self-published. Fransje lives in the leafy southern suburb of Constantia, Cape Town.